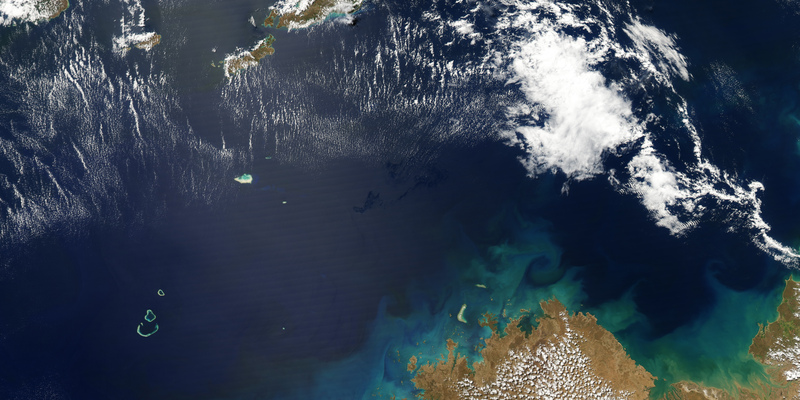 Looks like the ongoing oil spill gushing into the Timor Sea off northwest Australia may be worse than initially reported (see a slideshow of aerial photos and watch a video). 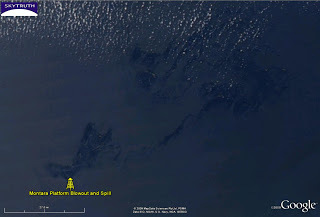 Oil slick from blowout during drilling off Australia. One observer this weekend estimated that oil slicks and sheen from the blowout in the Montara field extend across 180 km of ocean and are within 20 km of the Australian coast, in an area that The Wilderness Society calls a marine life “superhighway” for migrating whales, turtles and other animals. Location map showing site of Montara Platform blowout and spill. 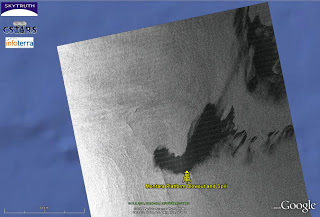 Detail of spill on TSX radar satellite image acquired August 30, 2009. Oil slicks and sheen (very thin films of oil) appear dark gray to black on radar imagery. Detail from NASA’s MODIS satellite image acquired August 30, 2009. 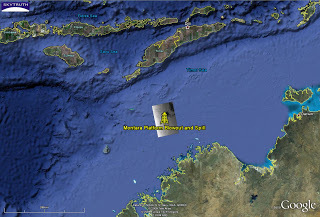 Slicks and sheen extend across more than 1,800 square miles of the Timor Sea. It will take at least several weeks before another drilling rig can get into the area to drill a relief well and control the spill. It’s worth pointing out to folks here in the US, who are considering opening new areas of our coastlines off Florida, Alaska, the Carolinas and Virginia to offshore oil and gas production, that this blowout occurred during drilling operations on a brand-new (installed in 2008) state-of-the-art platform. While these incidents have become less common, they still do happen. UPDATE 9/3/09: We’ve created a new online photo gallery with aerial photos, satellite images, and maps of this spill. Images will be added over coming days/weeks, so keep checking in. 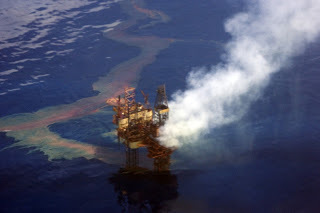 UPDATE 10/5/09: The company operating the West Atlas drill rig, Seadrill of Norway, has stated that the leak occurred from a previously completed well on the Montara oil platform while the West Atlas was drilling a new well on that platform. The Montara platform was built in 2008, and was installed in mid-2009 by Perth, Australia-based engineering company Clough after the original contractor, Saipem, bailed out to do a job elsewhere. John – can you advise us how to get hold of more recent satellite photos of the spill? We're trying to track progress but neither the government nor the company are releasing any data. PS. nice to see my photo of the platform is doing the rounds. THIS STORY IS CRIMINALLY UNDER-REPORTED IN THE USA! And at a crucial time when legislatures are being pressed to enact pro-drilling laws. The problem is not whether these accidents are preventible. While all the populous are busy arguing for and against drilling, it gives companies a free ticket to take shortcuts to improve profits. These sort of accidents have long been a thing of the past in the North Sea. Real drilling is not done by a bunch of yahoos and idiots like you see on the discovery channel. I have been working in the oil industry for 10 years and have never seen any incidents like this. If people would set aside there bias and actually talk to professionals about how we can safely gather the resources we need without damaging the environment, we would be so much better off. Proper regulation and oversight is the way forward. Any endeavor that runs unchecked ends in disaster! Displaced in STL – thanks for your perspective on this. I agree that proper regulation and enforcement are crucial to minimize the risk and the damage, and to penalize operators severely enough so they won't be tempted to cut corners. But inevitably, accidents will occur. Even in the North Sea. 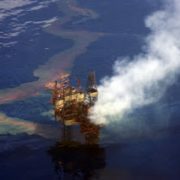 Although they haven't had a major blowout-caused spill since 1977 (the Ekofisk disaster released over 8 million gallons), there were blowouts that killed platform workers in 1985 and 1988. But blowouts are only part of the story. It's worth reminding our readers that oil spills happen in a lot of different ways. A recent North Sea example: in December 2007, Norway suffered its second-largest spill ever from a tanker that was taking on crude at a loading terminal in an offshore oil field. Nearly 1 million gallons were spilled in that incident (http://news.bbc.co.uk/2/hi/europe/7140645.stm).